Experience the beauty of Oʻahu South Shore as we sail toward Lēʻahi (Diamond Head) aboard the spacious Haleiwa Queen, a 50ft power catamaran, with 49 seats, an onboard restroom, a shaded deck, and complimentary beverages. Learn the history of Waikīkī where chiefs and commoners once lived. Our local born and raised crew members will share stories of their ancestors and experiences about growing up in this magical place, Hawaiʻi. Waterman their entire lives, our crew will share their passion, love, and respect for the ocean. You will explore the lively and vibrant ocean floor through our magnified glass bottom view ports. Enjoy the clear view of the Pacific Ocean as we cruise over live coral reefs, encounter tropical fish, honu (sea turtles), eel, reef sharks, dolphins, and humpback whales during season. Hawaii Glass Bottom Adventures: The Haleiwa Queen is located at Kewalo Basin Harbor boat slip #D104, just minutes from Waikiki. Sail just offshore Oahu’s southern coastline up towards Diamond Head past Waikiki and back out towards Ewa beach. 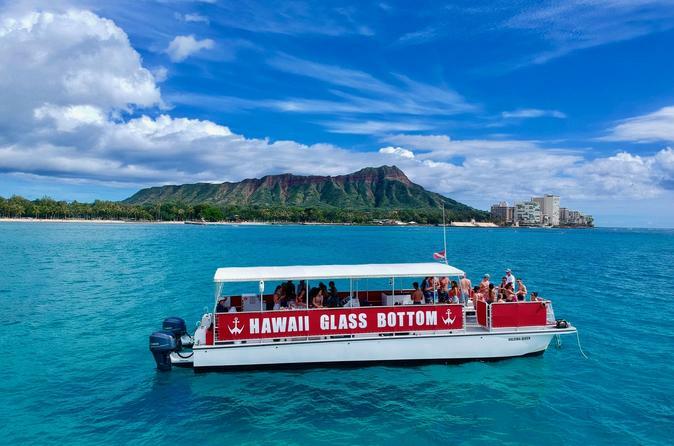 During the tour you will experience the underwater sea life of Hawaii, from four large glass bottom viewing stations on the Haleiwa Queen’s deck. While on your tour you will experience beautiful coral formations and old sunken ship hulls where schools of local Hawaiian typical fish live among the wreckage. On the surface during your tour you may get to see whales breaching and playing with their young during our winter months in the beautiful blue Hawaiian waters, while dolphins can be seen at times surfing next to the Queen as she motors along Oahu’s coastline. The Haleiwa Queen is a 50-foot Power Catamaran with an open-air design with a deck width of 14 feet that can accommodate 49 passengers. Every seat on her deck has a 360-degree view of one of the most beautiful coastlines in the world. The Haleiwa Queen sails with a crew of three, all CPR certified.